Karen Young is an asset to the OD Shag Club. Karen joined the ODSC in 2008 and has been involved since the beginning. She served as the Food Committee Co-Chair in 2008 and 2009. Karen served as the Membership Chairman in 2010 and 2011 and co-chaired the Cruise to Nowhere with Howard Stallings. 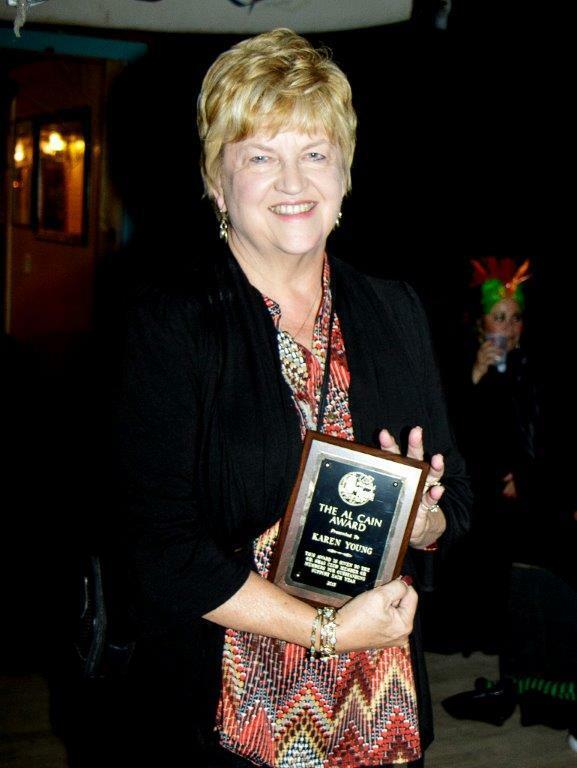 Karen was a board member 2012 and 2013 and she served as President of the OD Shag Club in 2014. Karen was one of the Co-Chairs for the Charity Golf Tournament in 2015. In addition the many committees she has chaired, Karen has helped with the Ways and Mean selling shirts and other items. She has sold 50/50 tickets. She has participated in numerous Clean Sweep events and has co-chaired the Charity Golf Tournament. She has obtained many sponsors and raffle items, which funds our charity giving. Karen participated in updating the By-Laws for the Club. Thank you Karen for everything you do for the OD Shag Club! I would like to thank the shag club members for my nomination for the Al Cain award and the Board Members for choosing me for the award. I was surprised and honored by this designation. The OD Shag Club has been our second family since we moved to the beach. I have enjoyed volunteering for the different committees and have made so many friends in the process. I plan to remain active in the Shag Club events in the years to come as the rewards for doing so are countless. The Joy of Christmas is giving. We would like to thank all the members who brought food for the two needy families that the OD Shag Club adopted for Christmas. The two families had a total of eight children for whom we were able to provide Christmas presents and brighten their holiday. 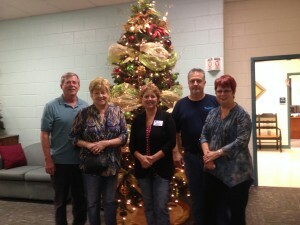 I also would like to thank Cindy Day for helping me to shop for the Christmas gifts; those members who worked so hard to sort the donated food for the two families; Bill and Joan Bacon for hosting the sorting job and Wendy and Donnie Schultz, Peggy Christie, and Rich Young who delivered the items to the school. It warms our hearts to be able to do this each year and provide a Christmas for families who need our help. I would like to start off by saying thank you to all the members of the OD Shag Club who came out and participated in this special evening. The residents of the Manor, and there were many in attendance, were so thoroughly entertained that by nights end everyone was still in their seats. The night started off with the OD Shag Club Dance Team, doing a couple of group dances. Linda Campbell, Lou Martino and Lenny Gardner then entertained the residents with a three-person dance. Lenny told a few jokes. The woman of the Club then proceeded to give out the brooches that the club provided. Cookies and punch were distributed while the brooches were pined on the lady residents. The party continued as yours truly cranked up the music and we danced with most the residents. Paul Craver arrived and entertained the residents with two beautiful songs “Make the World Go Away”, and “White Christmas”. As Paul sang these songs he worked the room looking into the faces and holding hands with many the lady residents, he certainly made them feel special. Thank you Paul. Linda Campbell and Lou Martino, who dressed as toy soldiers, came out and proceeded to march up and down the room, than stood at attention as Santa (Bob Sanders) made his entrance. Santa personally greeted each and every resident as the members of the club were distributing the presents. We were than entertained by Sheila and Bill Blazer, who are participants in the 2016 National Shag Championship. Sheila and Bill gave us a preview of their dance routine for the Nationals and the residents were in complete awe. All in all it was a very good evening both for the residents of the Manor as well as the members of the club. A special thank you goes to Jon Harris, our Master of ceremony for the evening. 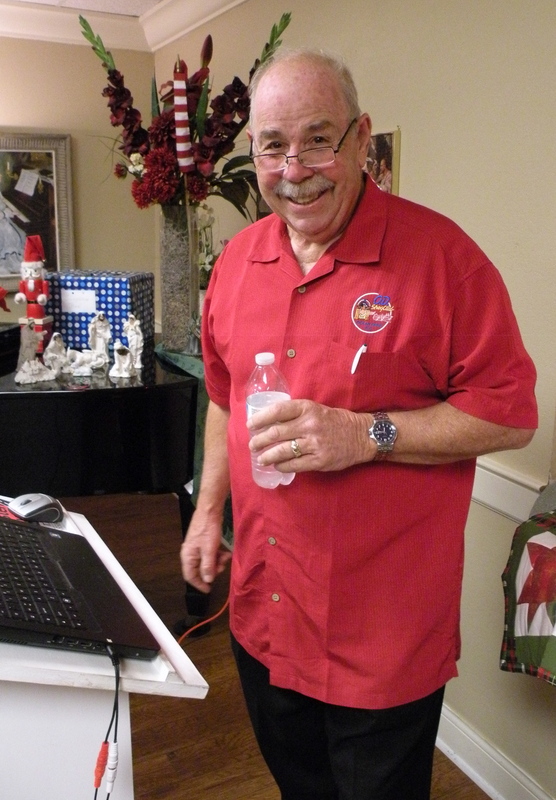 Until next year, this is Joe Ferlauto, your Myrtle Beach Manor Chair, saying thank you and may each and every one of you have a very Merry Christmas and a happy and healthy New Year. What a beautiful night for a parade! There was not a rain cloud in the sky, but there was a chill in the air. It felt like Christmas! We had 102 people that were in the finest Christmas outfits for the parade and 29 golf carts that were decorated from roof to the tires. What a great turnout! We had 2 toys soldiers to hold our banner to lead the OD Shag Club through the NMB parade then we had the walkers to hand out candy and beads to the children. Everyone did a great job. The OD Shag Club was escorted out by a giant 4-car train; then all the colorful and decorated golf carts followed. It was a great time for everyone that was in the parade……MERRY CHRISTMAS TOO ALL OF THE OD SHAG CLUB MEMEBERS. Camp Kemo during Fall SOS. Camp Kemo is a camp for children with cancer and their families. For these kids it may be a brief moment of joy in a life that has its share of pain and fear, and the week-long camp can provide them with a normal childhood experience. 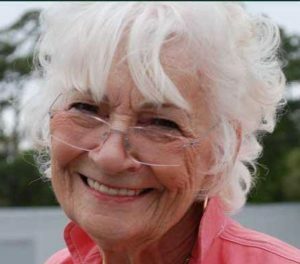 The Ellen Taylor Foundation for Junior Shaggers (ETFJS) was founded in 2007 by Mrs. Ellen Taylor. The purpose of the ETFJS is to remove financial barriers that prevent those under 21 from learning and participating in the shag dance. Examples of this include providing free dance shoes, funding workshops, and providing meal, lodging, and gas vouchers for shag dance events such as Junior SOS at North Myrtle Beach. 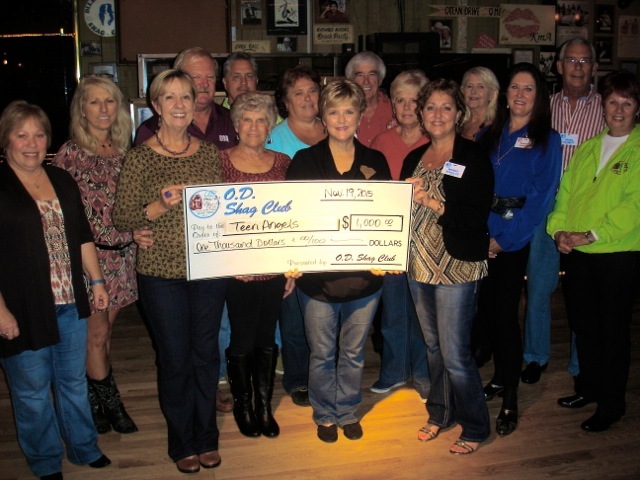 Our club was was proud to present a $500.00 donation to Ellen Taylor Foundation. The Hall of Fame Foundation provides financial assistance to people in need and has helped many of our members in the past. They help with medical expenses, wheelchairs, rehabilitation and much more. OD Shag Club supports the Hall of FameFoundation to help “Care for Friends”. The North Myrtle Beach Public Safety Explorer program is chartered through the Learning For Life subsidiary of the Boy Scouts of America and is open to young men and women between the ages of 14 and 20. This program is sponsored by the Law Enforcement division of the Public Safety Department in an effort to reach out to the youth in our community. Public Safety officers work with the Explorer Post providing a structured program that allows our youth to learn first hand about law enforcement practices and the application of state and local laws within our community. Teen Angel, a program that helps homeless North Myrtle Beach High School students. 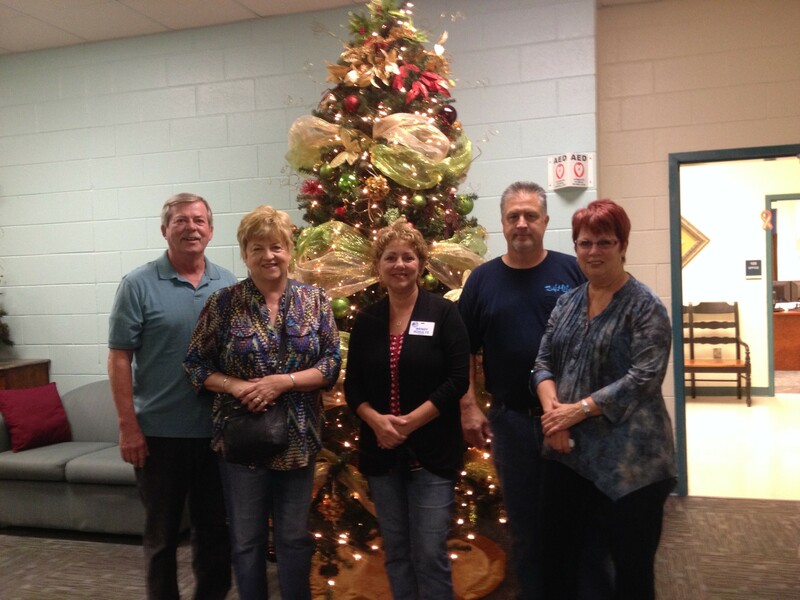 Teen Angel began as a way to provide homeless NMB students with Christmas gifts and food, the program provides the students with rental and utility assistance, fees for college applications, school supplies and food. OD Shag Club takes pride in having the opportunity to help with our $1000 donation to this worthy program. It has been a great 2015!!! This will be my last letter and it has been an honor to serve as your President. I can’t express enough to you how much I appreciate the Board, Committee Chairs and Members that have given their time and energy to ODSC, making this a wonderful experience. 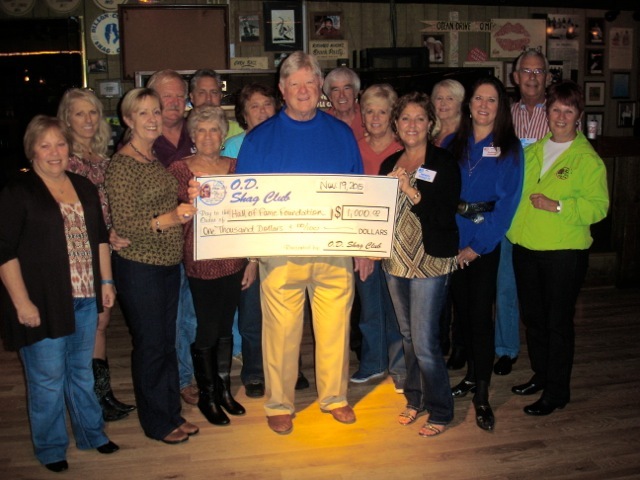 On November 19th at Fat Harold’s, the Board and a few club member met for the Charity Donations. The club was able to help the Hall of Fame Foundation, Ellen Taylor Foundation, North Strand Helping Hands, NMB Explorers, NMB Humane Society and Teen Angles. 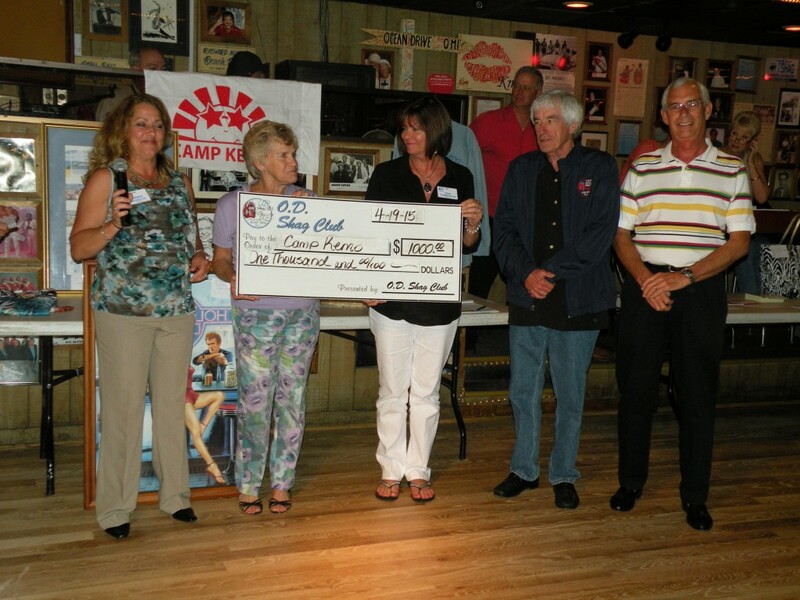 The members work very hard every year at the Charity Golf Tournament to provide these funds. Earlier in the year it also provided funds for Junior SOS and Camp Kemo. We had right at 200 members and guests attend our Thanksgiving/Re-Up Party on November 21st at Duck’s Beach Club. Thanks to Paul Craver for being our DJ for the evening and Duck’s for closing their business to the public and giving us a venue for our event. Donnie Schultz, Jim Queen and Faye Chowning, along with many volunteers, did a fantastic job preparing and serving the Turkey, Ham and Dressing. The Christmas Parade will be held on Saturday December 5th at 5:30pm. We will need to arrive no later than 5pm. It looks like good weather!! See the emails sent out by Billy Powell to get more information. At 6pm on December 7th, the ODSC will be going to Myrtle Beach Manor to entertain the residents. The club will be providing Christmas gifts from Santa, snacks, dancing and singing Christmas Carols. They look forward to our visit all year, so please make arrangements to attend!!! Our Christmas Party at Fat Harold’s is on December 12th, starting at 6pm. We will be collecting can goods along with nonperishable items for donation to less fortunate families. Ray Scott will be our DJ for the night and the Food Committee is already hard at work preparing a festive dinner. Merry Christmas and Keep dancing my friends!!!!! In Our Thoughts and Prayers…. Our dear friend and member has been in and out of the hospital for the last few weeks. He is still in his recovery stages, but it is taking longer than anticipated. He may have to go back into the hospital. He does like to hear from his friends and members. Please take time to send him a card and of course, he really can use your prayers for his recovery. 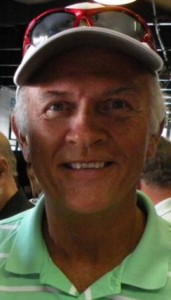 Our friend and fellow shag club member, Tony Cates, 68, passed away Wednesday, January 30 2019. He lived in Pinehurst, NC and Sunset Beach, NC. 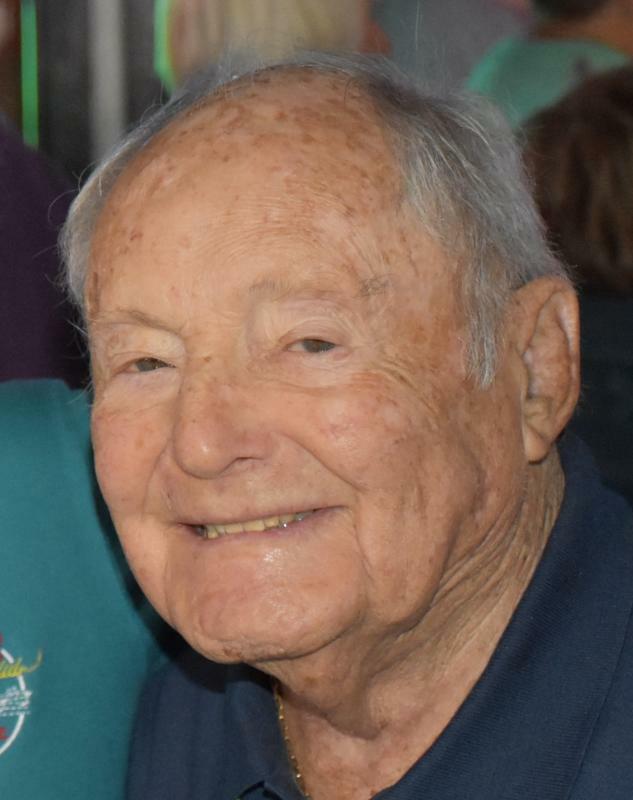 A visitation is being held Saturday, February 9th at 1-2 pm and a memorial service following at 2 pm at Boles Funeral Home Chapel, Southern Pines, NC 28387. Our friend and fellow member, Barre McClay, passed on Wednesday, February 27th at his home with his lovely wife of 59 years, Joyce, by his side. Barre always enjoyed his shag club family so much. Services will be held in his hometown of Washington, PA.